Our Springs luxury apartment homes include generous storage space, including walk-in closets, linen closets and large kitchen cabinets. But what about when it comes to securing jewelry, personal documents and other valuables? While our Springs communities have a high degree of safety, when it comes to valuable possessions, it pays to be cautious. Here are some of our favorite ideas for places to hide those hard-to-replace items. Kill two birds with one stone with this DIY art piece that doubles as a "safe." Find an old medicine cabinet and replace the mirror with a favorite print or design. Framed photos and wall art also make great hiding spots for documents such as passports and birth certificates. How ironic would it be if a potential thief switched on this closet light in search of easy-to-grab items? As a bonus, you get a functional light source that makes the contents of your closet more visible. Unless an intruder is exceptionally hungry, chances are good that he won't be searching through "food" wrapped in aluminum foil or stashed in Tupperware and placed inside the freezer. Hollowed-out books make a nice "cover" for jewelry and other small items. 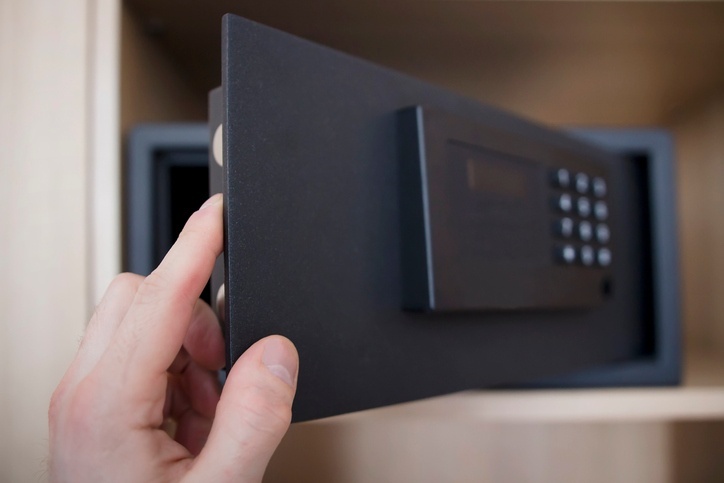 You can purchase book safes in a variety of sizes, or if you're feeling handy you can make a DIY version. Note that this method is most effective when you have other real books where the book safe can blend in. A single random book can appear a little too obvious. Most people won't expect to find valuable items in a kids' room. Just make sure you place the items in a spot that's safe from the kids themselves! Help yourself and the environment by recycling old soup cans for use as safes that can sit unobtrusively in your kitchen cabinets. Use cardboard or a similar material to create a false bottom in a bathroom or kitchen trash can, which will then be covered by a can liner. You can use the same method for trash cans on house plants. Place the soil inside a waterproof liner and store valuables underneath. Just to be on the safe side, put the items in a waterproof container as well. Pack valuables in a box or container, label it with a common category such as "Holiday Decorations" or "Winter Clothes" and include it with other stored items. No one will want to take the time to search through multiple boxes in hopes of finding something worth taking. Anyone who wants to steal your possessions wants to get in and out as soon as possible. One former thief recommends planting a fake stash, such as a $100 bill or costume jewelry, in a relatively easy-to-find spot to discourage intruders from looking further. Have you discovered a clever hiding spot for valuables? Share it with us in the comments. We won't tell!